In countries where e-Government is being implemented, levels of its development and adoption show pronounced disparities. These disparities could be attributed to mismatches in the strategies employed when pursuing the e-Government agenda and the lack of consideration of the contextual environment in which e-Government is implemented. This chapter aims to encourage informed e-Government strategy design in developing countries by referencing the “Quicksilver Initiatives” approach, which was used by the USA government during the Bush administration, culminating in placing America as one of the top countries in e-Government development. The chapter also aims to provide a platform on how these initiatives could be adapted to an emerging economy environment. 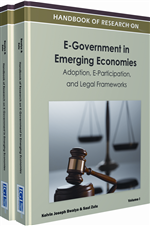 Further, the chapter uses extensive literature reviews to assess e-Government readiness of emerging countries in general and provides conceptual principles on which e-Government strategy should be hinged in developing countries. This chapter is timely, as it comes at a time when many emerging countries are trying to develop their e-Government strategic frameworks and roadmaps for leveraging government efficiency and competitiveness. Research of e-Government mushroomed around the mid - 1990s when computers were just being widely adopted worldwide. The genesis of e-Government was rooted in the motivation to have government information accessed through the Web. With the rampant innovation in information and communications technologies (ICTs), and the appearance of emerging technologies (such as wireless and social networking media e.g. Web2.0), e-Government can now be accessed through a multitude of platforms. These platforms can both be static and mobile (pervasive computing paradigm). It is worth adding that the idea of e-Government also stems from the business world. From Fredrick Winslow Taylor’s principles of scientific management to Total Quality Management (TQM) and 6 Sigma, the business world is now utilizing ICTs in processes such as Business Process Management (BPM) and Business Re-engineering (BR) to promote operational effectiveness and increased productivity and agility. With this trend, businesses and citizens are mounting a lot of pressure on governments to also employ ICTs with a view to improving public service delivery and attain social inclusiveness (Weerakkody et al., 2004). Although e-Government is often defined as “online government” or “Internet-based government,” many non-Internet “electronic government” technologies such as telephone, fax, short message service (SMS), multimedia messaging service (MMS), wireless networks, Bluetooth, television and radio-based delivery of government services can be used in the context of e-Government (Ngulube, 2007; Heeks, 2004; Anttiroiko & Malkia, 2006). There are many forms of e-Government: Government to Government (G2G), Government to Business (G2B), and Government to Citizen (G2C) (Kokkinaki, Mylonas & Mina, 2005) and these forms present the different stakeholders that participate in e-Government development. With these different forms of e-Government, different users (such as citizens and businesses) are accorded the chance to experience the benefits of e-Government. The different forms of e-Government also make it possible for different governments to implement e-Government with varying motivations. The motivations and emphasis of e-Government implementation have been unique in different parts of the world. For example, in the USA, the main objective is to automate and provide an integration platform between different islands of information so as to simplify and get the full benefit of what technology has to offer (Iyer, Baqir, & Vollmer, 2006; Navarra & Cornford, 2003; Baqir & Iyer, 2010). In Europe, the major motivation stems from the desire to modernize public services and offer better public services to the citizens (Cuddy, 2003). It is clear that in corrupt prone areas like Africa, the major motivation of e-Government will be to promote accountability, transparency and good governance thereby reducing corruption levels in the public sector (such as implementing e-Procurement to reduce corruption in the tendering and procurement processes) and promote socio-inclusiveness where citizens, regardless of their social or economic status, can give input on governmental matters by utilizing the ICT platform. Successful e-Government implementation comes with many benefits such as enabling citizens to participate in decision making processes regarding issues of national importance, enabling participatory democracy and social inclusion, reducing the cost of public service delivery, reducing corruption, and it engenders an efficient public service delivery system (Bwalya & Healy, 2010; Navarra & Cornford, 2003; Heeks, 2004; Kumar & Best, 2006). For the benefits of e-Government to be amassed, there is need for developing countries to put in place far-reaching organizational and institutional reforms, remove dysfunctional centralized governance systems and traditional patterns of social interaction, and promote robust e-Government awareness campaigns (Maumbe & Ntombovuyo, 2009). This should be coupled with active ICT streamlining initiatives across all the public sector business value chains. Quicksilver Initiatives: E-Government strategies and roadmap aimed at fast-tracking the development of the e-Government institution in the US. It was coined during the Bush administration. E-Government: The platform through which the government (government line ministries, branches and organs) interacts with its citizens and business entities for the sake of exchange of information, public services and participatory democracy through the use of ICT platforms. ICT Infrastructure: It encompasses all the devices, networks, protocols and procedures that are employed in the telecommunications or information technology fields to foster interaction amongst different stakeholders. Strategy: Roadmap or plan of action meant to achieve a set goal. ICTs: Acronym which stands for Information and Communications Technologies.